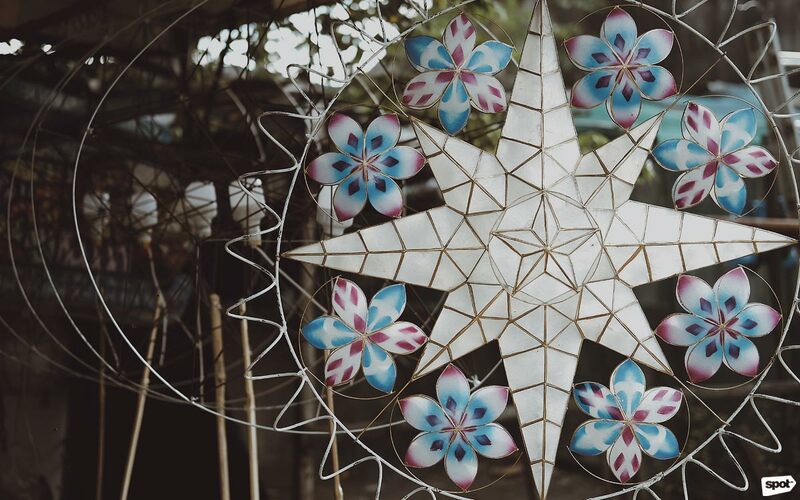 A look at the history and artistry that goes into each Filipino parol. (SPOT.ph) Christmas often comes to the Philippines dressed in bright colors and extravagant light displays, painting the holidays with a distinctly Filipino look. It’s true: The way we celebrate Christmas has always been one of a kind; with traditions that go beyond mere history. 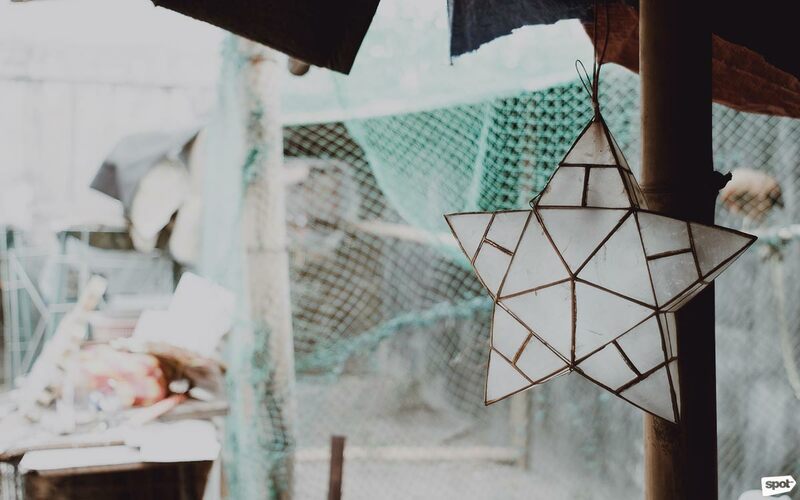 But when it comes to Christmas traditions, there’s nothing quite like the parol to reflect the Filipino character. As soon as the -Ber months hit, the streets of Pampanga light up with countless lanterns on display. 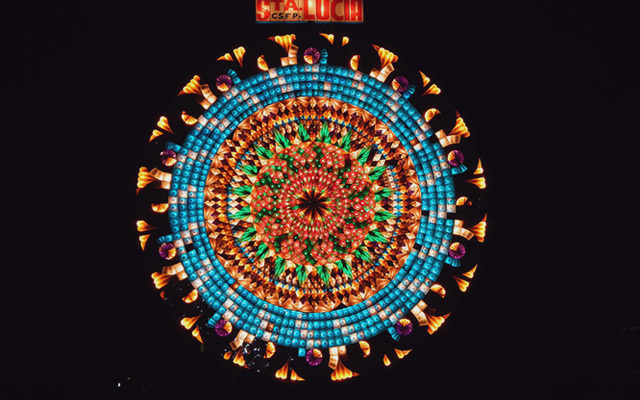 The parol we know today boasts intricate geometric patterns, equipped with dancing lights that make the intricacy all the more impressive. The Philippines has seen the rise of different designs over the years, with improvements in our existing technology paving the way for bigger, better, and more complicated lanterns, but the people of San Fernando know that it all began with a few strips of bamboo and some colorful papel de japon. 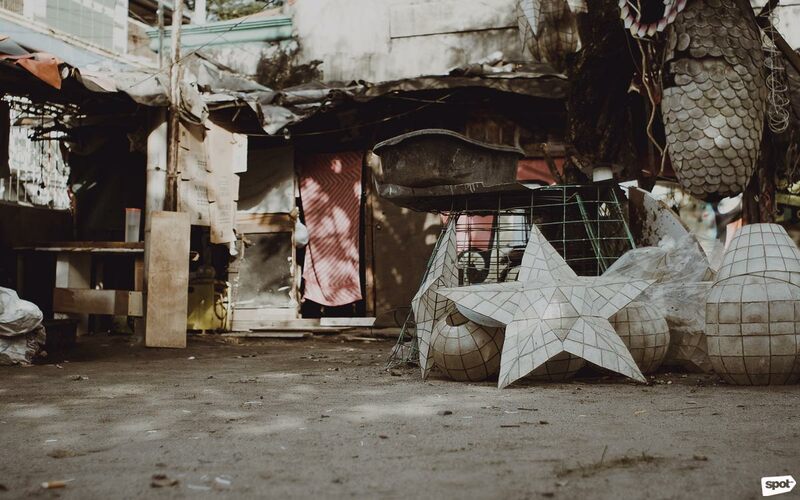 The art of parol-making began with Francisco Estanislao, who is believed to have crafted the first parol in 1908 using the traditional five-point star design. Back then, electricity has yet to come to Bacolor (former capital of Pampanga) and according to popular belief, lanterns were used by the townfolks to light the streets on their way to attend the Simbang Gabi. Some also say that the lanterns were brought along the procession of patron saints as people walked from barrio to barrio. Derived from the Spanish word farol, which means "lantern" or "light," it seems only apt for the parol to have evolved into what it is now. When electricity came to Pampanga, light bulbs replaced the candles that illuminated the parol. Soon after, dancing lights were introduced—at first manually operated with various switches, until the invention of the “rotor,” a mechanism that allowed for the lights to play out as intended by the maker. Today’s Christmas lanterns feature bold patterns and tantalizing light displays, made with all sorts of materials from shells to plastic, and even to fiberglass. 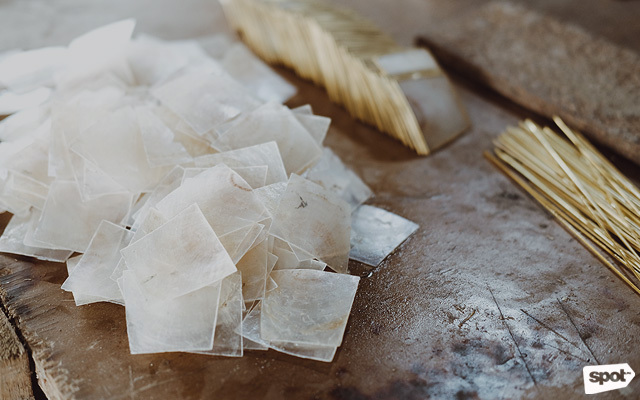 Some of the most popular lanterns sold in the market today are made from capiz shells, which are so durable and translucent that they're often used in place of glass. 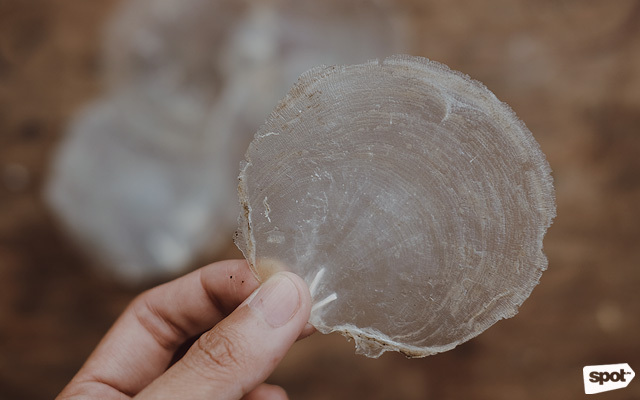 The shells come from windowpane oysters, commonly found in muddy or sandy shores, bays, coves, and lagoons. The shells are washed clean of any grime before cutting. The translucence lets light peek through, making them the perfect material to make lanterns. The shells are cut according to the pattern, using guides to make sure the measurements are correct. They have a certain iridescence to them, adding to the charm of a capiz lantern. 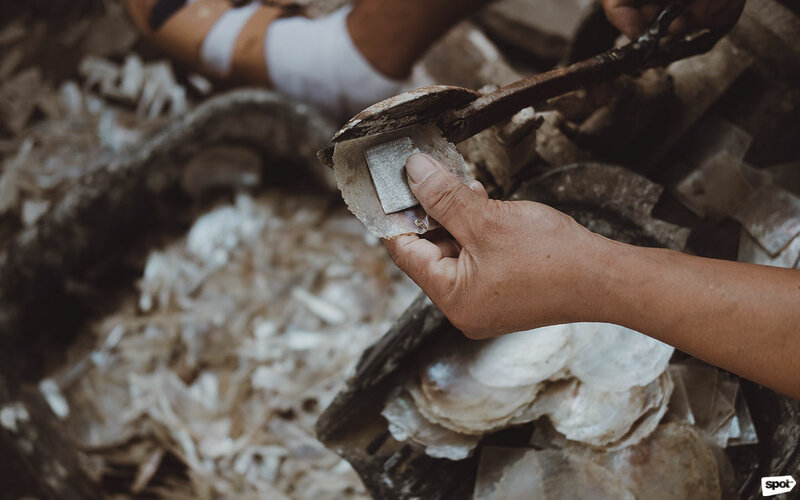 Each shell is cut according to patterned guides made beforehand, following whichever is needed for the whole piece to come together. 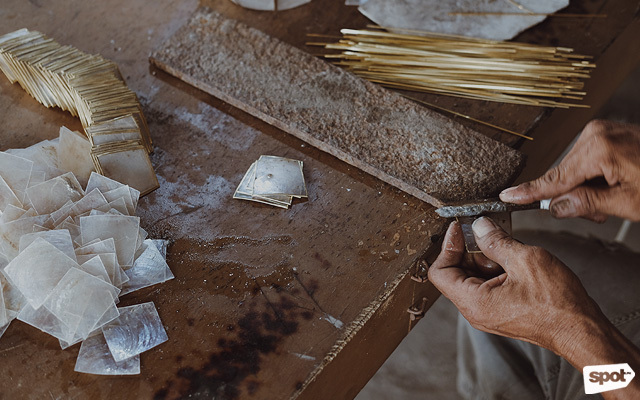 Designs had to be carefully planned: Lantern-makers would work on a concept, make a sketch, and work on getting the right measurements before setting off to work. The cut capiz are lined with strips of brass. The brass strips are pulled through the metal slot to fold them in shape. They seal the brass strips in place with some light hammering. 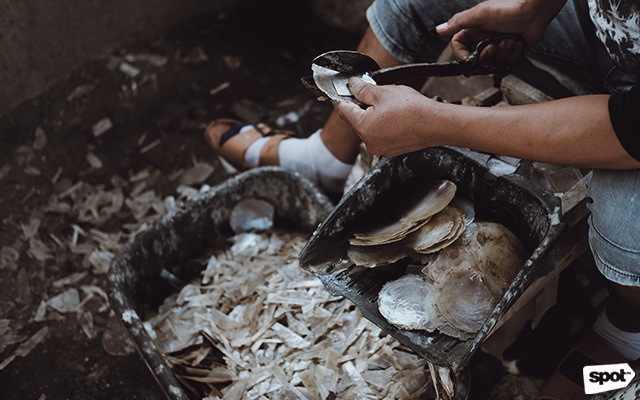 From there, calloused hands work on putting the brass lining around the shells. Thin, brass plates would be cut into strips and pulled through a metal slot to fold them halfway. They won't be folded completely—instead, there's a gap where the edge of the capiz can fit into. Light hammering would do the trick to mold the plating together with the shell. 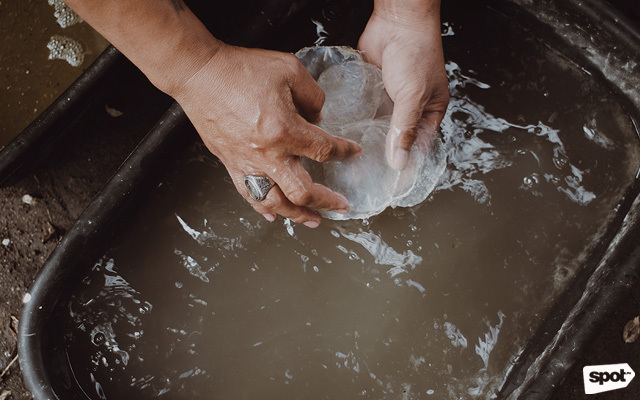 Back then, the brass strips had to be molded by hand, but today, ready-made linings can be bought to make the work slightly less tedious. According to the lantern makers of 888 Capiz Lanterns and Decors, they start working on projects as early as June, just to make sure they have enough to sell once September hits. 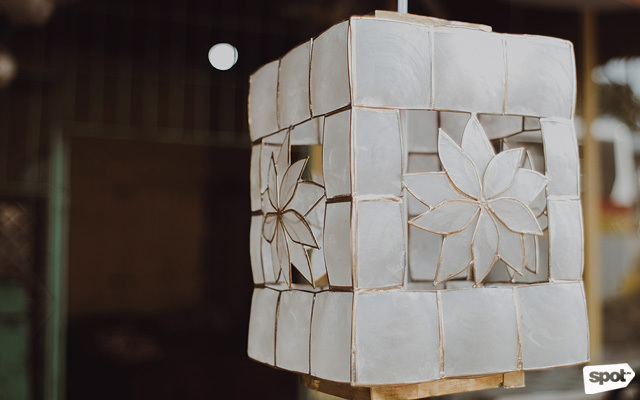 The small shop, located in Mabalacat, Pampanga, often work on made-to-order lanterns, customizing the design according to their clients’ instructions. These lanterns sell out even when it's not Christmas yet. Star patterns and intricate lanterns are crowd favorites, but when Christmas rolls around, orders for ornamental lamps also start rolling in. 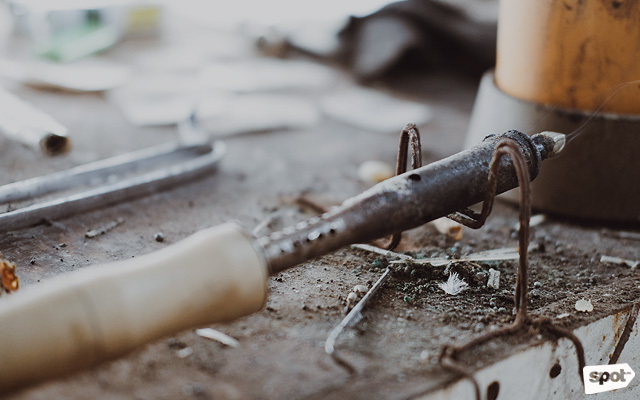 The hot rod is used to melt the metal that will hold the pieces together. 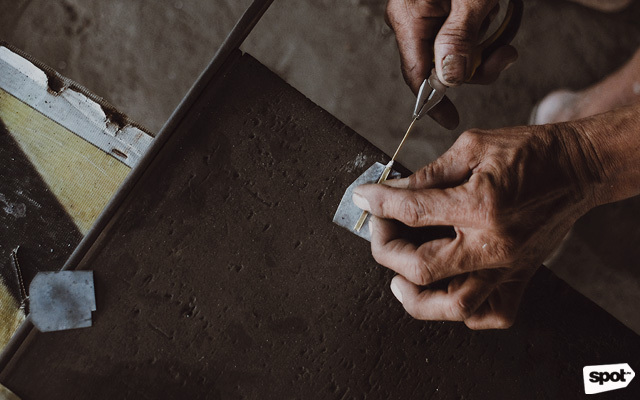 Shells should be cut precisely, as they would be welded together later on and the smallest difference could affect the alignment of each part. Small ornaments don’t need additional frames to support the structure: the shells can hold up pretty well on their own once they’re neatly assembled. Light bulbs of your choice can be installed inside, though people often opt for warm lights to illuminate the lamps. In some cases, the shells are left as they are: Pearly white and translucent. In others, they’re tinted according to the design, looking like stained glass pieces. Over the years, lanterns began to fascinate people from all over the world. Some would even argue that the Christmas Capital of Asia is the Philippines, which holds different festivals and parades featuring lanterns from all over the country. The most famous would be San Fernando City’s Ligligan Parul. Sta. Lucia's Giant Lantern, 2012. More commonly known as the Giant Lantern Festival, the annual competition has different barangays make lanterns as tall as 20 feet. The competition is held every year, coinciding with the start of the first Simbang Gabi mass. 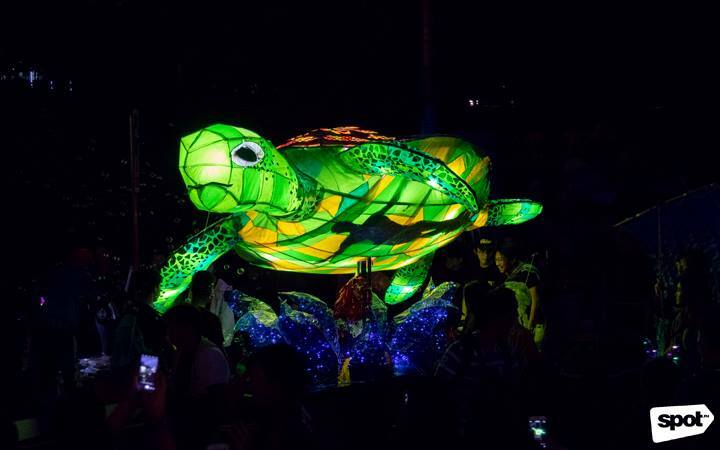 This turtle-shaped lantern was part of UP's 2018 Lantern Parade. Those living in Manila are probably more familiar with the University of the Philippines’ Lantern Parade, which veers from the typical San Fernando parol and instead features floats of different forms, all lit up and displayed around the university. Las Piñas also celebrates their own Parol Festival, which gives significance to the more traditional five-point star parol. Across the country, you’ll find different celebrations honoring the parol. 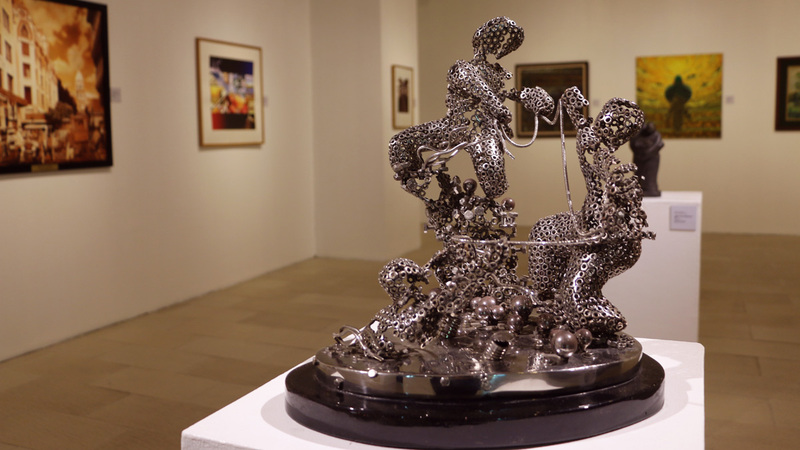 Filipino communities abroad also organize their own festivals, bringing a piece of home with them into the limelight for the rest of the world to appreciate. 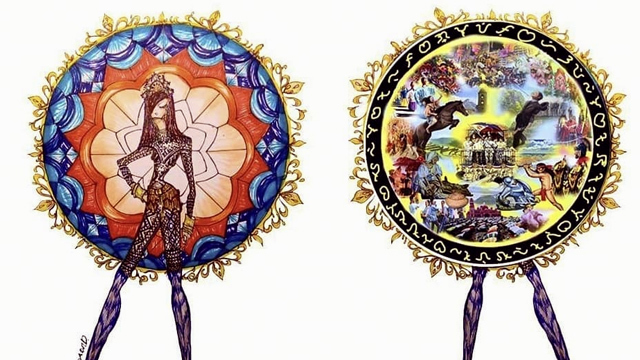 It even took the spotlight in the international stage when crowned Miss Universe 2018 Catriona Gray showcased the parol in her National Costume. 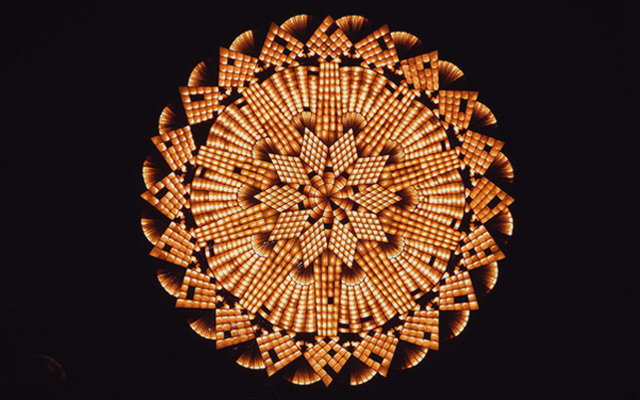 People don’t often see past the dancing lights of a parol, but one regular-sized lantern can take over a week to complete. 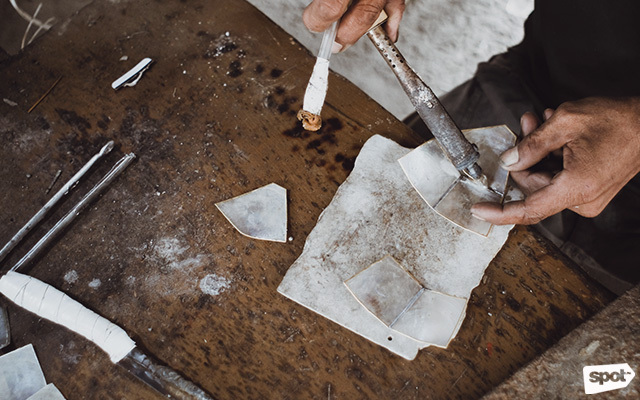 For artisans, each parol means countless afternoons bent over the table as they cut and hammer and weld pieces together. Beyond the playfulness, beyond the grandiose, beyond the colorful display of a parol lies hours and days and weeks of hard work. 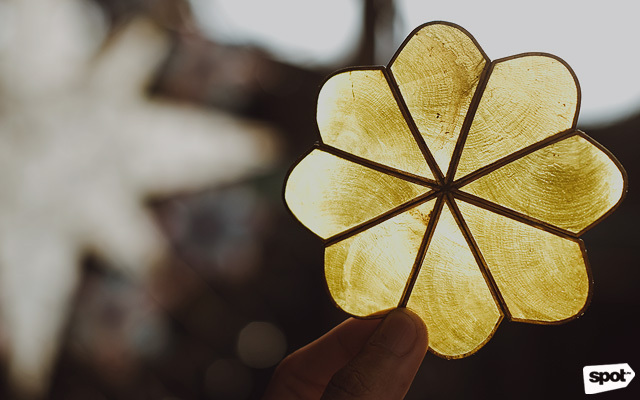 Piece by piece, a parol is assembled by meticulous hands, craft and artistry coming together with culture and history; celebrating, perhaps, the very essence of the Filipino Christmas.